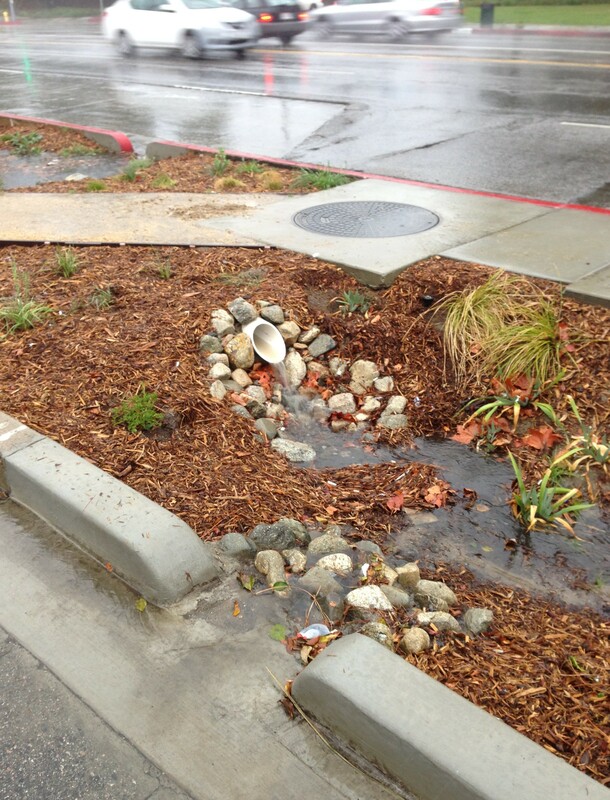 This morning’s rainfall makes a creek out of the newly completed Woodman Avenue green street medians. I just posted an article at L.A. Streetsblog that wouldn’t be out of place at L.A. Creek Freak. It’s the first part of a series where I’ll be exploring the connections between streets and creeks. 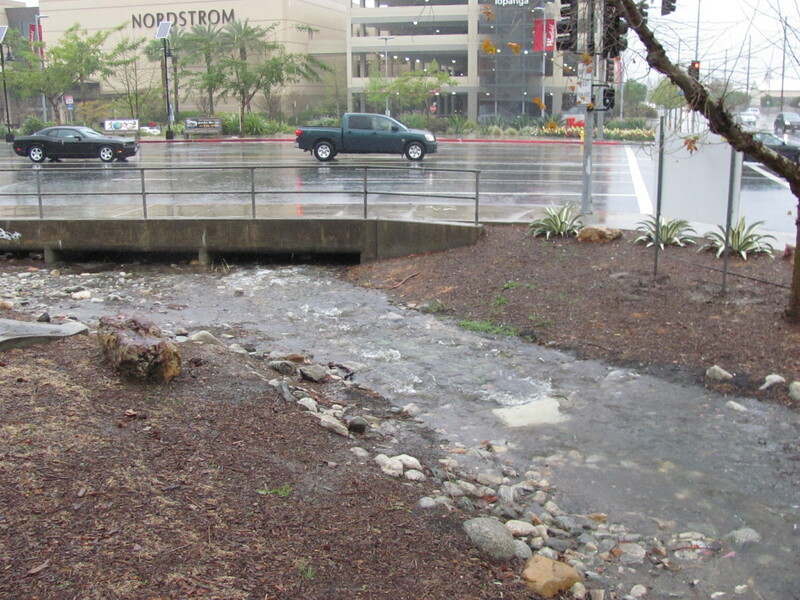 I’ll be highlighting various green street projects, this article shows off the recently opened Woodman Avenue Multi-Beneficial Stormwater Capture Project – a collaboration of The River Project and the City of Los Angeles. I got a chance to bike in the West San Fernando Valley last week, and took a few photos of the Los Angeles River bike path project under construction. It’s a construction site right now, but a lot of the hardscape – new bridges and bridge undercrossings – appears more-or-less done. I got a chance to kayak the L.A. River yesterday. I’ve been kayaking in the river a few times here and there, and most memorably the incredibly wonderful three-day expedition in 2008. Yesterday was the first time I officially, legally, kayaked with a permit! April 4th is the deadline to give comment on a draft EIR that if approved will consign another small creek to permanent pipe-age in the City of LA. [Updated paragraph] Download the draft EIR from this City of LA site by clicking Environmental/Draft EIR in the left panel of that page. Then click on the bold-font title of The Village at Westfield Topanga to be taken to a download site. That bold font fooled me when I first wrote this post, didn’t understand that it was a hyperlink. Thanks to readers for setting me straight! It can also be found at the Central Library, and Woodland Hills, Canoga Park and Platt Branch libraries or purchased on CD-Rom. 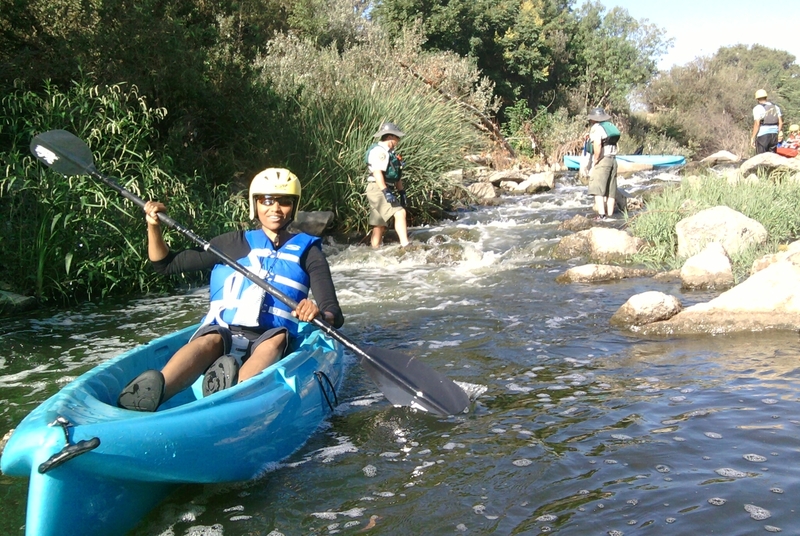 The creek – located at Owensmouth and Victory in the San Fernando Valley, has been dubbed Owensmouth Creek by locals. Its history is a little tricky to me, as it doesn’t appear on historical USGS maps. GIS data from the County of Los Angeles, however, does indicate what looks to be a diversion of drainage from Topanga Canyon Boulevard in the San Fernando Valley, labelled as an open channel. Navigate LA calls it a city stormdrain, D-17768. But more incontrovertible is photography. Jim Anderson, of the Woodland Hills Warner Center Neighborhood Council, shared with me a photo of the threatened waterway. Destined for a pipe? Photo: Roger Gerrish, provided courtey Jim Anderson. Channel? Bed? Banks? Sediment? Water (including seasonal)? Direction of Flow? Looks like we’ve got a stream that meets the City’s definition. So why again is this small edge of the property being piped and paved, not set aside as a public park, or dare we suggest, part of the Low Impact Development/stormwater mitigation plan? I’m told it’s needed for part of a Costco members’ service station at the planned Village at Westfield Topanga, folks. I’ll just leave us all to ponder that for now. Coverage in the Daily News here. Join Los Angeles City Councilmember Dennis Zine for the groundbreaking of the West Valley Los Angeles River Greenway. 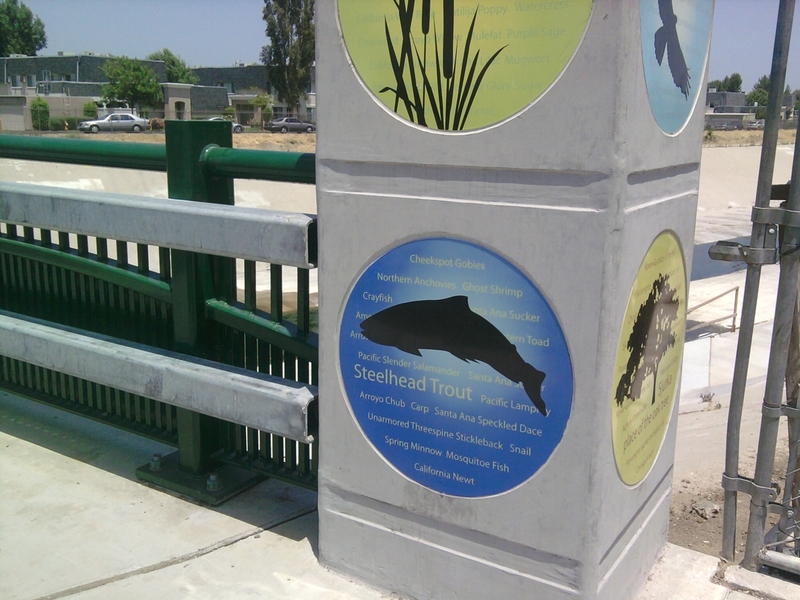 The ceremony takes place tomorrow – at 2:30pm on Thursday March 10th 2011 on the southern bank of the Los Angeles River just upstream of the Vanalden Avenue Pedestrian Bridge. L.A. Creek Freek reported on this project earlier – backgrounding it in a 2008 article, then reporting on construction and funding last year. See those articles for details. Briefly, the multi-phase project includes 2 miles of bike path (from Vanalden Avenue to Corbin Avenue) and river-friendly landscaping and entry-point mini-parks. It’s being done in conjunction with bridge retrofit projects on Vanowen, Winnetka and Tampa. Come on down and celebrate the groundbreaking tomorrow! At this morning’s meeting, the Los Angeles City Board of Public Works awarded a contract for Phase 1 of Los Angeles River bikeway and greenway construction for the West San Fernando Valley. The initial phase (of a three-phase project) extends 0.8-miles from Corbin Avenue to Vanalden Avenue. The full 2-mile project will go from just above Mason Avenue all the way to Vanalden in the communities of Winnetka and Reseda, respectively (map below.) This landscaped grade-separated bike path will be the first Los Angeles River revitalization project implemented upstream of the Sepulveda Basin. Creek Freak reported briefly on this project in 2008, then again last week after I noticed construction on Winnetka. Today’s approval wasn’t controversial or significantly different than what we shared earlier, but it does clarify some of the timeline, scope, etc. What follows is a somewhat dry description of all the construction project phases… oh boy! Construction is underway on a couple of Los Angeles River bridge retrofit and widening projects in the west San Fernando Valley. Specifically work is proceeding on the Tampa Avenue Bridge and Winnetka Avenue Bridge in the Valley communities of Reseda and Winnetka, not far from Los Angeles Pierce College. The bridge projects include river- and historic-themed artwork, a portion of the Los Angeles River bike path, and native landscaping. You are currently browsing entries tagged with San Fernando Valley at L.A. Creek Freak.